He sees you when you're sleeping; he knows when you're awake. We're talking about Elf On The Shelf, of course, the little guy (or girl) who plays Santa's proxy in the days leading up to Christmas to make sure kids are being good. The problem is, Elf On The Shelf is supposed to move around the house every single day. That's 24 days of original and creative poses. 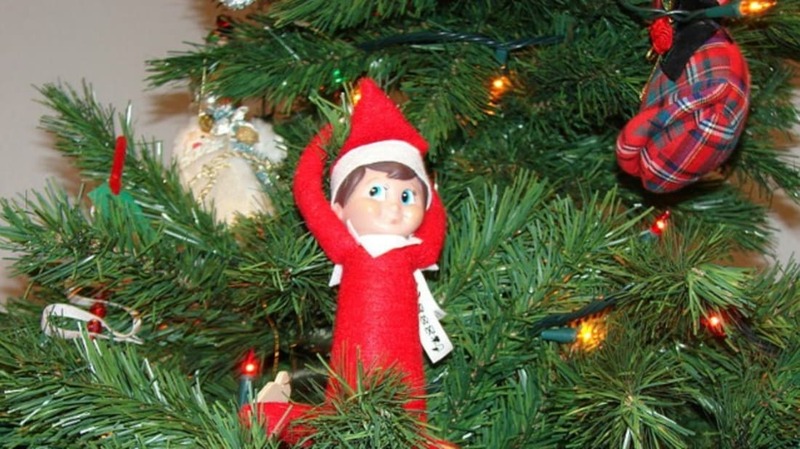 Before you give up and just start sticking Elfie in different spots on your tree every day, here are 34 ideas to try. 1. ELF ON THE SHELF ENCOUNTERS ELSA. 2. ELF ON THE SHELF MESSES WITH THE COPIER AT WORK. 3. ELF ON THE SHELF TAKES A BATH. Dexter made some Star Wars paper snowflakes! 5. ... BUT DARTH DOESN'T APPRECIATE IT. Warning my friends, I don't 'do' elf on a shelf. I, like Vader, find their lack of shelf disturbing. 6. ELF ON THE SHELF GOES FISHING. Good Morning! 🌥 Day 1 of Elf on The Self was successful. Joseph woke up looking for his buddy Jake and found him fishing in his toilet 🎣 . This is going to be a fun month for us! 8. ELF ON THE SHELF PULLS A CHRIS PRATT. 9. ELF ON THE SHELF GETS INTO A SNOWBALL FIGHT. 10. ELF ON THE SHELF MESSES WITH THE BABY. 11. ELF ON THE SHELF WORKS ON HIS FITNESS. 12. ELF ON THE SHELF IS IN A BAND. 13. ELF ON A SHELF GIVES THE FRUIT BOWL SOME PERSONALITY. 14. ELF ON THE SHELF NEEDS CAFFEINE. 17. ... AND FLOUR ANGELS. Our #elfonashelf think he funny tho. 18. ELF ON THE SHELF... UM... MAKES COOKIES. 19. ELF ON THE SHELF GETS ON SPIDEY’S BAD SIDE. 20. ELF ON THE SHELF CHANNELS ELF. 21. ELF ON THE SHELF HAS SEEN TOO MANY HORROR MOVIES. 22. ELF ON THE SHELF IS THAT JERK WHO EATS STRAIGHT OUT OF THE PEANUT BUTTER JAR. 23. ELF ON THE SHELF HAS A SIDE GIG AS A MECHANIC. 24. ELF ON A SHELF TOILET PAPERS THE TREE. 25. ELF ON A SHELF FINDS HIS INNER JUSTIN TIMBERLAKE. 26. ELF ON THE SHELF CREEPS ON BARBIE. 27. ELF ON THE SHELF IS THAT GUY AT THE PARTY WITH A GUITAR. 28. ELF ON THE SHELF EATS THE LEFTOVERS YOU WERE PLANNING ON HAVING FOR LUNCH TODAY. 29. ELF ON THE SHELF STEALS FROM KIDS. 30. ELF ON THE SHELF DOES NETFLIX AND CHILL. 31. ELF ON THE SHELF IS GETTING UP IN YOUR CEREAL. 32. ELF ON THE SHELF MESSED WITH THE WRONG GUY. 33. ELF ON THE SHELF BROKE HIS LEG, AND THAT’S WHY HE HASN’T MOVED IN TWO WEEKS. 34. ELF ON THE SHELF IS AN OVERACHIEVER.